For my collection of photos and random thoughts from yesterday’s Brooklyn Bacon Takedown, click the photo below. – The bourbon bacon ice cream won the people’s choice award. I’ve had butter pecan ice cream with a shot of bourbon at a local restaurant, and that rocked my world. This interpretation was just as good. – I wasn’t competing. I went just to eat. And eat I did. All 30 samples. – Yes, Brooklyn is the best place in the world. The fun, eating creative class lives here and I’m happy to call them friends. 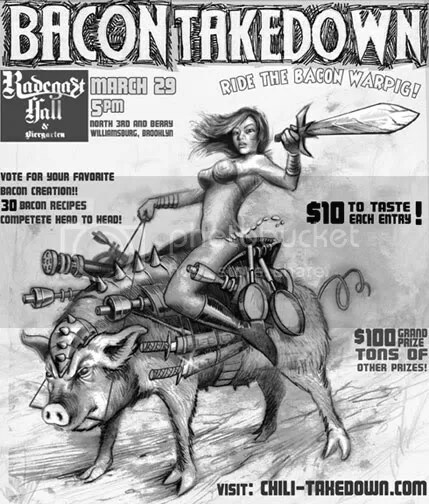 Brooklyn Bacon Takedown, Today at 5 p.m. This is where I’ll be tonight – drinking beer and surrounded by glorious bacon. This entry was posted in Eating or Cooking and tagged bacon, brooklyn, brooklynisthebestplace, cookoff, matttimms, takedown. Bookmark the permalink.